Not a Cop? Stop Pretending (Even if you Are A Cop)! While I was drinking my coffee one morning last week, scrolling through the local newspapers, I came across a story about Skokie police finding a car in the parking lot of the AMC Showplace Village Crossing movie theater that looked like a police squad car, but wasn’t. Then, on Wednesday night I was watching Chicago P.D., and the episode was about (***SPOILER ALERT***) a crew of criminals that used stolen police cars, uniforms, and badges to pull people over and extort money from them. The news story and the TV show got me thinking about the crime of impersonating a police officer, and the danger that comes with it. The car found at the Skokie movie theater was allegedly traced back to an officer of the Chicago Police Department. According to news reports, that Officer has been placed on administrative duty pending an internal investigation. In Illinois, it is illegal to dress your vehicle up to look like a police squad car if it is not actually a police squad car – even if you are a police officer. Doing so can get you charged with a Class A Misdemeanor, punishable by up to 365 days in jail and/or a $25,000 fine. If you use that car to stop or detain someone, the penalty rises to a Class 2 felony, which is punishable by 3-7 years in the Illinois Department of Corrections (“IDOC”). It might also result in a charge of False Personation of a Police Officer, but more on that below. 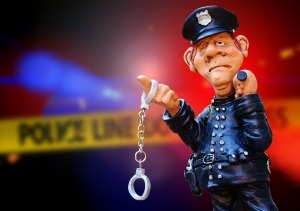 Finally, if you are a police officer, it could also result in disciplinary action being taken by the Police Department. According to news reports, the Officer’s car – a Ford Taurus Police Interceptor – was equipped with clear oscillating LED lights in the front and rear windshield, a siren switchbox in the center console, a spotlight outside of the driver’s window, and bulletproof panels on the front doors. What is illegal about that? While it is not illegal to put bulletproof panels on your car, put a spotlight outside of the driver’s window, or drive a Ford Taurus Police Interceptor, it is illegal to put oscillating or flashing lights on your car (unless your car falls into the specific categories set out in 625 ILCS 5/12-215). Pursuant to Illinois law, only specific types of cars can bear oscillating or flashing lights of certain colors, and if your car does not fall into one of those categories, you can be charged criminally. For example, you can only have red or white oscillating, rotating, or flashing lights anywhere on your car (whether they are lit or not) if your car is a law enforcement vehicle, fire vehicle, rescue vehicle, or tow truck, to name a few. Similarly, amber colored lights can only go on vehicles such as Illinois State Toll Highway Authority vehicles, public utility vehicles, and fleet safety vehicles, among others. Finally, blue lights can only go on vehicles such as rescue squad vehicles, law enforcement vehicles, and organ transplant vehicles, in addition to a few others. If your car doesn’t meet the definitions proscribed in the statute, you can be charged criminally, and if you are a Police Officer, administratively. If you are not a police officer, when you combine all of the elements that were allegedly present on that Officer’s personal vehicle, it might rise to the level of False Personation of a Police Officer. Specifically, it is illegal in Illinois to knowingly and falsely represent yourself as a police officer, and doing so is a Class 4 Felony, punishable by 1-3 years in IDOC. Several factors can come into play when determining whether you knowingly and falsely represented yourself as a police officer, such as whether you were wearing a police uniform, displaying a badge (fake or real), or using words or actions that would suggest you are a police officer (such as driving a police lookalike car). The penalties get worse if you impersonate a police officer while carrying a deadly weapon (Class 3 Felony, punishable by 2-5 years in IDOC), while attempting to commit or committing a felony (Class 2 Felony, punishable by 3-7 years in IDOC), or while attempting to commit or committing a forcible felony (Class 1 Felony, punishable by 4-15 years in IDOC). The reasons behind the laws against impersonating a police officer are two-fold: danger to the community and danger to police officers. There is obviously a safety concern when people dress up like, and pretend to have the authority of a police officer. Police officers are supposed to be people the community can trust, and when a fake or stolen badge, uniform, and/or vehicle is used to trick people for a criminal purpose, it not only puts the public in danger, but it also places real police officers in danger. With that being said, if you should find yourself under arrest for false personation of a peace officer, if you are pulled over and charged with having oscillating, flashing, or rotating lights on your vehicle, or if you have been arrested for any other reason, contact us here at LauraLaw immediately, and one of our experienced attorneys will be happy to help you navigate the legal system. If you are a police officer who has been accused of these violations, or any other violation of Illinois law or department directive, contact us immediately, to discuss our representation of you throughout all criminal and/or administrative proceedings.